PDF Unlocker is a simple and useful application that will remove the password and restrictions on any PDF file that you can read. There are two types of passwords that can be used in a PDF file. To remove type 1, that is printing, copy & paste restriction, just drag your PDF file on to the link on your desktop (on to PDF Unloacker icon). With in a few seconds it will remove the password and allows printing or copying & pasting the contents from the PDF File. To remove type 2 requires you must know the password to open the file. You can then remove this password and any restrictions. 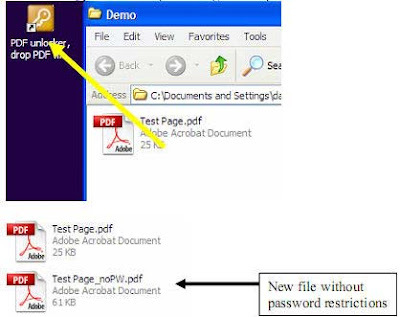 Right click Remove PDF Password link (icon) and choose edit. Directly after ‘-sPDFPassword=’ Place open password, without quotes. Close and save file. Then drag and drop the PDF on to the link on your desktop. You can rename the file if you want. The application is tested and found to be working properly and fast. It can be removes 40 or 128 bit passwords. As best I can tell, all this is is a simple CMD script that uses GhostScript to open the PDF and then write it back out as a new PDF. Note -- v1.04 is broken. The CMD file has errors in it. echo This may take a minute, please wait. gswin32c -dSAFER -dBATCH -dNOPAUSE -sDEVICE=pdfwrite -sFONTPATH=%windir%/fonts;xfonts;. -sPDFPassword= -dPDFSETTINGS=/prepress -dPassThroughJPEGImages=true -sOutputFile="%tt%_noPW.pdf" "%1"
For removing type 2, it won't let me save the changes after I type in the password. What do I need to do? HELP! I'm trying to remove Type 2 and when I type the password in it won't let me save the CMD file. What do I do now?? HELP!!! Does anyone know how to contact the developer of Softonic Freeware PDF Unlocker 1.0.4 for a software-related question/problem ??? My 6 attempts so far have been unsuccessful. PD. I don't speak english, sorry.. Thank you for cleaning up the blog site. Greatly appreciated! Hopefully someone will provide the contact info of the developer of the Softonic PDF Unlocker 1.0.4 for a software tech question (not working on Win XP SP3).